I hope you enjoyed the last sensual wrap up. And without further ado, here’s the final post to wrap up my coverage of Rothbury Music Festival featuring my behind-the-scenes tour with the Rothbury Green Team. The pictures and videos below will take you through our behind-the-scenes tour of Rothbury Green Team Compounds. Like we did last year we got to see how The Green Team sorts and recycles all the waste and compost left behind from over 30k fans over four days. 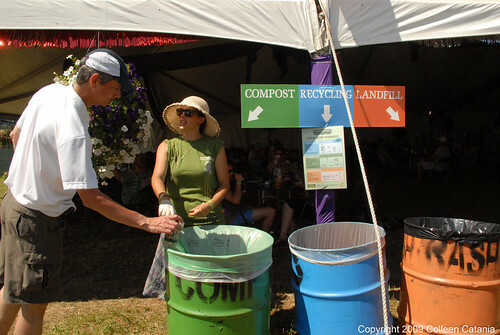 It was pretty amazing to see and learn about Rothbury’s efforts to educate fans with their Green Team of over 500 hundred volunteers from across the world, with their help Rothbury continued to make Rothbury a sustainable and green music festival, even when the economy presented many challenges. In my researching green music festivals, I also learned a lot about the sociological history of festivals reading this 8 Green Music Festivals article. And once you’re done checking out the videos below, I also encourage you to check out the links below to get more info on Rothbury’s Green mission. You can also see more of Colleen’s photos from the Green Team Tour here. Director’s note:I’d like to apologize for the video quality. I really enjoyed the tour, but I didn’t necessarily have all the right equipment with me. So I recorded these two videos guerrilla style with my Blackberry Storm so the sound isn’t the greatest and in some parts it a little dark and shadowy. But nonetheless you’re still able to get a great idea of what it was like to go behind scenes and explore Rothbury’s Green Team Biodiesel and Sorting Compounds. Before each video I’ve included notes and links to where you can get more information. While I love to write about live concert experiences, I’m still learning about all what it means to be “green” so if you were on the Green Team, this year or last, I welcome any feedback, questions or corrections on any of the videos, notes or pictures. Tom Beals of Haymaker Biofuels and Sarah Haynes of Spitfire Agencyexplain how Rothbury uses biodiesel. It was interesting to hear them talk about Rothbury’s commitment to use various mixes of biodiesel to adjust with the economy’s many challenges this year. Led by SpitFire Agency’s Sarah Haynes, The Rothbury Green Team explains what goes on at the sorting compound. As you’ll see, it was really loud and clanky in the Sorting Compound as the Green Team sorted through all the bags of recycling, compost and landfill. While I held the camera I managed to fire off a couple questions asking the Green Team how many volunteers returned from last year (around 30%), how the Green Team is trained and what they do with 75 roll offs. The behind the scene’s greening efforts that took place at Rothbury were absolutely stupendous! The festival would not be the same if it weren’t for the little things that are paid such attention to. One of the aspects to greening that went on at Rothbury which to me is so important are the “pods.” Which is what the majority of greener’s did at Rothbury. This job entailed standing behind a set of three properly labeled trash cans: green= compost, blue= recycle, and red= landfill. Other than acting as garbage goalies, it was the volunteers job to make sure that patrons were properly educated on the “what goes where” process. Volunteers were actually encouraged to call people back to the cans if an item was placed in the incorrect spot to give them a hard lesson on where things belong. Doing this demonstrated that if it’s done wrong you’ll be held accountable, and it actually made the volunteers job easier because they wouldn’t have to fish after that piece of trash. Thanks for giving props to all the hard workers that make Rothbury green!